In 1910, Horace de Vere Cole and five friends, including Virginia Stephen (who would marry Leonard Woolf in 1912) and her brother Adrian Stephen (a classmate of Cole’s), coordinated and successfully carried out an elaborate hoax against the Royal Navy. Cole began by sending a telegram to the HMS Dreadnought, moored in Dorset, telling the crew to expect a visit from a group of North African princes. 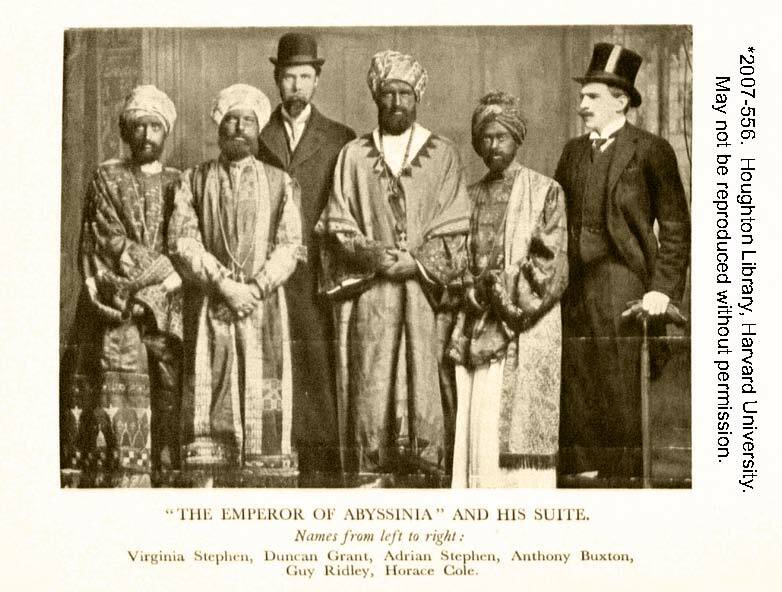 Dressed as the “The Emperor of Abyssinia” and his attendants, the group was received by the Dreadnought‘s crew, and was given a tour of the ship. The group spoke to each other in broken Latin, and shouted made-up words to show their appreciation. Following the event, Cole sent this photograph to the Daily Mail to reveal the ruse. When the Royal Navy demanded that Cole be punished, he countered that it was they who should be punished for allowing themselves to be fooled. An account of the “Dreadnought Hoax” was written by Adrian Stephen and published in 1936 by Virginia and Leonard Woolf’s Hogarth Press. 2530 copies of the book were printed, though 1530 copies were later pulped. Unlike earlier Hogarth publications which were handprinted by the Woolfs and decorated with unique handmade papers, The Dreadnought Hoax is rather simple, printed commercially, and decorated only with photos of the adventure. The photo above is the frontispiece. *EC9.W8827.Z936s. Purchased with the Theodore Sedgwick Library Fund. Image may not be reproduced without permission.